It’s official — Walmart is going to pay $3.3 billion, $3 billion of which will be in cash, to purchase the entire online operation of fledgling retailer Jet.com. This is reported to be one of the largest ever acquisitions of an e-commerce firm. While the $3 billion will be paid out over an undisclosed period of time, an additional $300 million in Walmart shares will also be part of the package. Founded by Diapers.com creator Mark Lore, Jet.com publicly launched during 2015 as a membership-only retailer; basically an attempt to be the online version of warehouse clubs like Costco and Sam’s Club. Conceptually, Jet.com was attempting to undercut Amazon by purchasing items in bulk quantities. However, Jet.com pivoted to a retail model that was open to the entire public about three months after the site initially launched. After dropping the $50 membership fee for customers, Jet.com had to increase prices on bulk items in order to stay profitable. It’s likely that Walmart is interested in a business model that competes directly with Amazon’s Subscribe & Save model. Jet.com‘s bulk purchasing option drives the price down similar to Amazon’s attempt to generate repeat orders of the same product by offering an additional discount. Purchasing items in larger quantities has always been a common interest for the typical Walmart brick & mortar customer. By offering the same option online using Jet’s pricing model, the company may encourage brick & mortar consumers to purchase more items in bulk online and completely skip the next visit to a physical Walmart location. As part of the acquisition, Walmart gets access to Jet.com‘s customer data as well as the pricing software that keeps customers coming back for more deals. Analysts believe that the Jet.com customer base is possibly more affluent than Amazon consumers. On average, household income for an Amazon customer is around $68,000 while a typical Walmart household makes about 15 percent less. 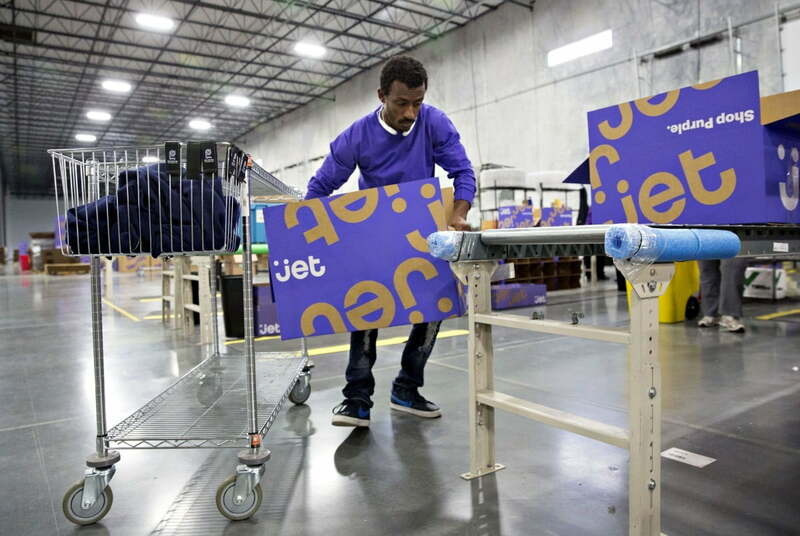 Of course, it will take more than buying Jet.com to revitalize Walmart’s stagnant online retail business. Walmart generated roughly $12.2 billion in online sales during 2014, then $12.5 billion during 2015. Comparatively, Amazon generated about $70 billion in online sales during 2014 with an increase to nearly $80 billion in 2015. Earlier this year, Walmart launched a competing shipping service to Amazon Prime called ShippingPass. Priced at $49 per year (as opposed to Prime’s $99 fee), the service offers 2-day shipping on bestselling items listed on Walmart.com. However, the volume of items included in the two-day shipping program total up around one million, a far cry from the 30 million items included under Amazon Prime. While Walmart previously couldn’t compete with the bevy of other perks that Prime customers receive with a subscription, this Jet.com purchase may make a difference. Before, Amazon’s perks like access to streaming video content on Amazon Instant Video, unlimited photo storage with Prime Photos, music streaming with Prime Music, and a free book to read each month in the Kindle Lending Library seemed to put the retailer head and shoulders above Walmart. Amazon also allows family members to share a Prime membership; an option that Walmart currently doesn’t allow in the ShippingPass program. But now, the tides may have changed. We’ll just have to see what becomes of this latest business deal.